We will be using Holiday Blend espresso at the Roasteria through January. We are finding that most Brazils have a much higher level of citric and malic acidity this year, as a result Illuminator has been very hard to maintain. I have decided to shelve it until we can find a good supply of coffees that fits the “Illuminator” profile. Thank you Joe for the nice review. 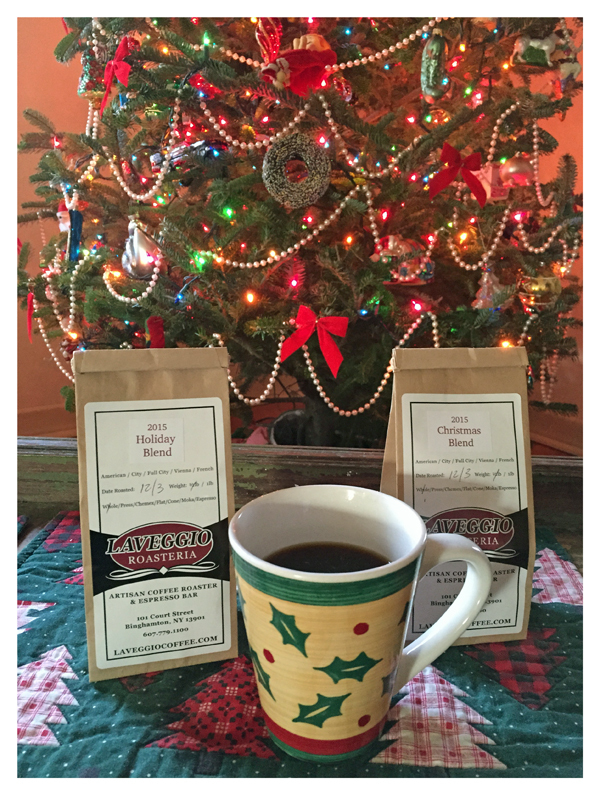 Last holiday season I discovered “Christmas Blend” at our local coffee shop here in Binghamton, NY https://www.laveggiocoffee.com and I had to give it a try. If it says Christmas it has to be good, right! I purchased one pound and had them grind it for me as well, quickly becoming my favorite seasonal roast. At the end of November this year I noticed on their website they would offer the ‘Christmas Blend” once again for the holidays along with two others, Holiday Blend and Yuletide. I promptly made my ordered! Having recently purchased a coffee grinder I opted for the whole bean. The early morning light gleaming through our home office window, the ambient glow of four Christmas trees and a pipping hot cup of “Holiday Blend” and I’m in coffee heaven. Lastly in the coming days the “Yuletide” roast will be released completing my holiday coffee addiction. Do you have a favorite Holiday roast or coffee? I’d love to hear about it. Christmas Blend: Chocolate, buttery mouth feel, candied fruit, spicy finish. Holiday Blend: Orange & fudge.